FORWARD OPERATING BASE WHITE HOUSE, Afghanistan – We’ve reached the final frontier in Helmand province. 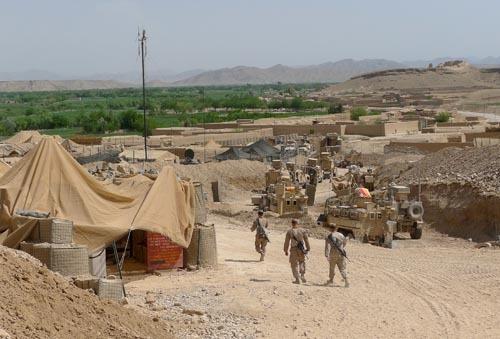 This base serves as headquarters to 1st Battalion, 8th Marines, which oversees combat operations in Kajaki district. Top Marine officers in Afghanistan acknowledge they’ve pushed as far north here as possible ahead of the planned drawdown, and will seek this summer to solidify gains already made, rather than pushing farther into the countryside. There were about 20,000 Marines in theater last summer, but that number could drop to as low as 7,000 this fall. In coming weeks, we’ll have several long-form pieces assessing the future of Kajaki and what it means for the Marines of 1/8. It’s a fascinating area that is best known for a hydroelectric dam built in the 1950s. It also has been part of multiple struggles in the last few decades. For example, at least one Marine position in the district has artwork suggesting it was used by the Russians in the 1980s during their fight against the mujahedeen. Our arrival here also was interesting. We responded to a wakeup call before 3 a.m. to catch a packed pre-dawn CH-53 helicopter flight north out of Camp Bastion, part of the massive Camp Leatherneck complex in Helmand. Each of us had just enough room to sit upright in our seats, with a pile of palletized supplies, packs and bags taking up the rest of the space. White House itself offers a mix of austere living and creature comforts. There is no plumbing and nearly everyone sleeps in tents, but air conditioning is in abundance and the chow hall tent has a flat-screen TV. The base is surrounded by majestic mountain tops and ridges, but has had only one significant firefight, on March 19, with them to date. No Marines were injured, and at least four enemy fighters were later detained nearby. One of the photographs here show the initial sight upon our arrival today. 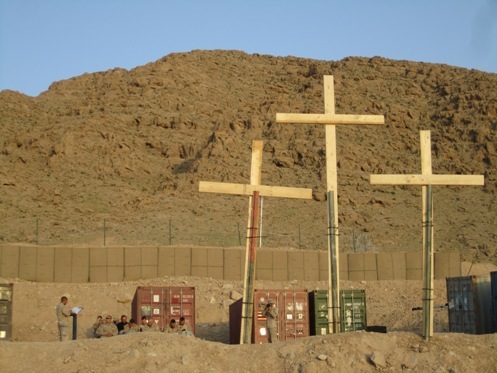 At least a dozen Marines here participated in a sunrise Easter Sunday ceremony on a hill overlooking the helo pads. Additional services were held in the tent chapel later in the day, including a 7 p.m. celebration from which photographer James Lee and I just returned. Stayed tuned in coming days for more images and slices of life from the battlefield. We’ll be visiting a couple of different patrol bases and observation points, and post here on Battle Rattle as we go.